I have anxiety today. It's about money. I'm pretty sure my plan is sound, but I'm spending a lot of money and it's stress inducing. My anxiety was precipitated by having to scramble a bit to cover a check. I'm within my (admittedly loose) budget, but I didn't figure to need more money in my checking account until Kerrville was over. I'm not broke or poor, just strapped for cash until I get settled on the land, get a job and my tenant starts paying rent. That should take three months at the max. But it's stressful right now. The Dutchman falls asleep and Margaret blows the candle out. 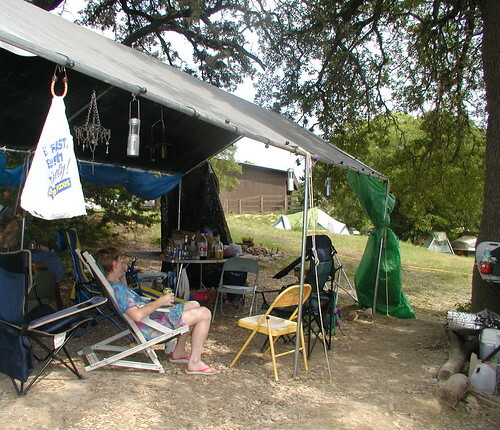 Here's a picture of my camp (Camp Moco Verde) from a couple of years ago. It looks almost the same right at this very minute. I wish I was there. I love that song. I hear it in Toby's voice.